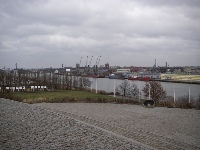 Westerplatte, situated at the entrance to the harbour and just a few kilometres from the city of Gdañsk, is where World War II broke out on 1 September 1939. The small Polish garrison heroically held out against the attack for seven days before surrendering to the German forces, and the site is now a memorial to the defenders. The Germans suffered unexpectedly high losses, especially considering that there were only 180 Polish defenders, who fought knowing that they had no chance of reinforcement or resupply; after seven days they were forced to surrender due to lack of supplies, but the invading forces allowed the surrendering Major to keep his sword in recognition of his bravery. Sights at Westerplatte include a towering memorial, a small museum (often only open in summer), and the ruins of the barracks and guardhouses left from the shelling, which stand dilapidated and rather spooky. There is a permanent outdoor exhibition detailing the history of the Westerplatte peninsula, which was a popular health resort before the outbreak of the First World War. The military remnants are situated in a picturesque area and the peninsula can be reached by bus, although the scenery is best appreciated on a boat trip or a bike tour.